Posted on May 17, 2017 September 11, 2017 by Joseph Alban, L.Ac. Essential oils are super versatile and can be used in a myriad of ways, including direct application to the body, diffusers throughout the rooms, household cleaning products, and even as a means to keep livestock free of viruses and bacteria. But, a lesser-known but amazingly effective use is the application of essential oils is alongside acupuncture in Chinese Medicine. When we look at the basic properties of essential oils in relation to Chinese Medical theory, we can see how the two complement each other. distilled, volatile (meaning they can evaporate at room temperature) therapeutic oils made from peels, leaves, needles, seeds, roots, woods, resins, and barks. The distillation process brings forth the essence of whatever organic matter is used. So, in a sense, this leaves you with the essential nature the plant. As a result, essential oils have a natural resonance with the essence of humans. In Chinese Medicine, the essence of a person is known as a type of Qi called Jing. Jing is the qi that we are born with, our most basic life force. Jing qi is responsible for growth, maturation, and reproduction. Jing, along with our spirit, Shen, reflect who we are, our individuality. As we go through life there is a natural unfolding and decline in our Jing or essence, but often this process is accelerated by taxing life experiences that lead to illness, both major and minor, chronic and acute. Essential oils help to correct the underlying imbalances that may be leading to your illness. Looking at the illness from a Chinese Medicine perspective, we can choose the appropriate essential oils to address whatever ailment you are suffering from in order to restore you to your healthy, whole state. 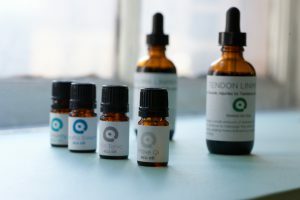 Most ideas about the effects of essential oils are based upon their chemical composition providing antiseptic, antimicrobial, or anti-itching properties; or that the inhalation of essential oils improves anxiety and depression by stimulating the release of neurotransmitters such as dopamine and serotonin. [1,2] Combinations of essential oils have even helped people with alopecia regrow their hair! These are exciting concepts, but what is amazing is that with more research, scientists have found that the body has olfactory (smell) receptors in internal organs and throughout the skin that react to the composition of the essential oil. This is not smell in the traditional concept of smelling, but rather chemical sensors throughout the body. Science is confirming what Chinese Medicine understood thousands of years ago! In Chinese medicine, each essential oil affects particular organs, and has specific functions such a warming, cooling or neutral temperature, and a level of qi that they correspond with. They are chosen according to these various properties and blends are customized to each person. The essential oil blend is then applied to acupuncture points for therapeutic effect. 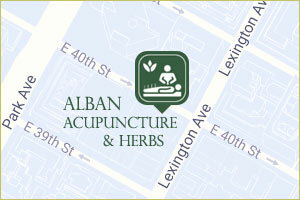 Like acupuncture, essential oils have a specific moving, balancing, or tonifying effect on the body. The oils can access the nuances of your particular presentation, and guide your body back to its healthy state. In essence (pun intended), a treatment that incorporates essential oils has tremendous potential to fend against daily stressors as well as restore you in times of acute or chronic illness. Want to try Essential Oils? Call for a consultation with Amber Milanovich, L.Ac. our expert in essential oils. 1. Lv XN, Liu ZJ, Zhang HJ, et al. Aromatherapy and the central nerve system (CNS): therapeutic mechanism and its associated genes. Curr Drug Targets.2013;14(8):872-879; PMID: 23531112. 2. Edris AE. Pharmaceutical and therapeutic potentials of essential oils and their individual volatile constituents: a review. Phytother Res.2007;21(4):308-323; PMID: 17199238. 3. Hay IC, Jamieson M, Ormerod AD. Randomized trial of aromatherapy. Successful treatment for alopecia areata. Arch Dermatol.1998;134(11):1349-1352; PMID: 9828867.